As mentioned, I’m not that good at taking pictures of my stuff. But, here are two cakes that I was able to acquire pictures of because they were at a party where someone besides me was in charge of the camera. 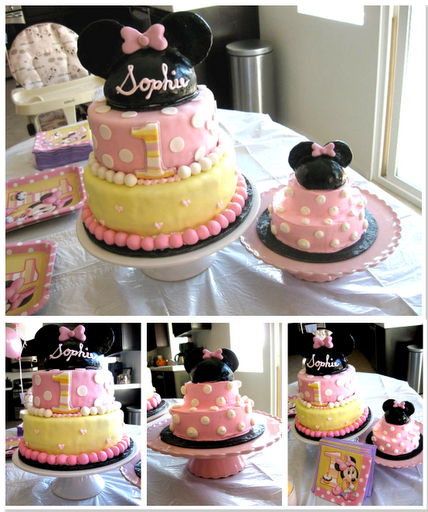 This first one is a Mini Mouse cake for Sophie’s first birthday. The cake was a vanilla cake with peach mousse filling. I found Wilton’s ball cake pans that I used for the hat on the big cake. For the larger cake, the ears are simply cardboard rounds. I found Wilton’s mini ball cake pans for the hat on the mini-Minnie cake. In this one, the ears were made from Oreo cookies. Since the hat was covered in fondant, Sophie’s older brother enjoyed that little hat. I used this fondant recipe to make my own fondant. I LOVE this recipe, but the blogger is so right that you MUST use the name brand products for it to turn out right. If you use off brand marshmallows and sugar, the texture won’t be as gummy and the fondant will tear and crack. For the pink and yellow fondant, it was easy enough to knead in the dye. But for the black fondant, I tried to dye it and only got to a dark grey. So, after applying the dark grey fondant to the hats, I painted dye straight onto the hats to give ‘em that shiny black look. 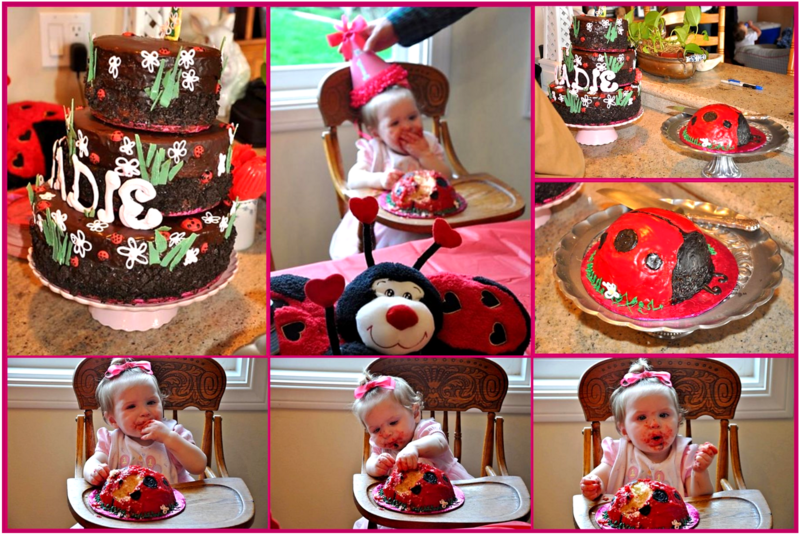 This second cake is a ladybug cake for my super cute neice and god-daughter, Madison. My sister-in-law requested a yellowcake with chocolate frosting, which is a pretty basic flavor, but I wanted to give it more of a gourmet feel. So, instead of a classic chocolate frosting from the can, I made a chocolate gnache with half milk chocolate morsels and half semi-sweet morsels. Combined with the cream and butter, it had a very rich and smooth flavor and texture. I made the letters for Madie’s name out of pink white chocolate, piped right onto wax paper (with a tootpick coming out the bottom so I could stand them up). In fact, that’s how I made the grass and flowers, too. Piped white chocolate onto wax paper in the shapes I wanted. After frosting the cakes with gnache, I pressed crushed up Oreo cookies into the sides to give the effect of dirt, then placed the grass, flowers and ladybug candies as I saw fit. For her small cake, I used the Wilton’s ball pan. I ended-up buying red and black frosting (her b-day was around Valentine’s, so it was readily available). I had tried to dye some butter cream, but as is often the case, I couldn’t get the color red enough. As you can see from the pictures, she really loved it. And of course it was a fun messy cake for the sweet little one-year-old, who is now three. So, I just joined Pinterest… which means I have come over to the dark side! There are so many great crafts and desserts and homemade gifts that I want so badly to make that I am tempted to leave my job and become a full time Pinner! Of course, there isn’t much money in full time crafting (at least not that I know of!). So I will continue being a hobby crafter for now. I will share my versions of the pinned items here if I remember to take pictures of them. I’m the worst at snapping photos of my projects. But I will see what I can pull up from the past and I will try to be better about it in the future!